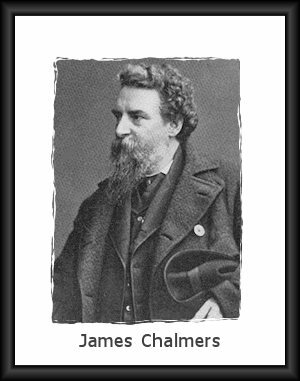 James Chalmers (1841-1901) was a Scottish missionary-explorer who served in Rarotonga in the Cook Islands for ten years, and in New Guinea from 1877 until his brutal murder by cannibal tribesmen on April 8, 1901, during a missionary trip to Goaribari Island. James Chalmers. The Greatheart of New Guinea. James Chalmers. Short biography and chronology of events. James Chalmers: Missionary to Cannibals. Short biography. James Chalmers. One of the Unreturning Brave. James Chalmers: Chronology of Life. Life in New Giunea: The Inhabitants. Jane Hercus Chalmers: First missionary wife of James Chalmers. "A lady of quite exceptional gifts and graces ... her early training had been an admirable discipline for the work and experience which came upon her..." A school-mistress in Leeds, Miss Hercus married James Chalmers on October 17, 1865, and faithfully served with him until her death on February 20, 1879. Chalmers said of his dear wife Jeanie, "She was a whole-hearted missionary." Eliza Large (Harrison) Chalmers: Second missionary wife of James Chalmers. Previously married to a Mr. Harrison for nearly twenty years until his death, they had only one surviving child, a son Bert. Engaged to Chalmers when he was in England, she arrived in New Guinea a year later and they were married October, 1888. Chalmers says of Lizzie, "She was a good, true, loving wife, a faithful, earnest follower of Christ, ay blithe and hearty, and seldom looked on life's dark side ... She had a wonderful knack of making herself at home and of making friends." In July, 1900, Mrs. Chalmers became seriously ill. "For fourteen weeks she was ill, but steadily growing in Christ ... She was thankful for her long illness, notwithstanding the great suffering, as it gave her time to understand better, to get a clearer view and a stronger faith. Often she could be heard in praise, saying, "Peace, perfect peace!" "In my Father's house are many mansions." "Jesus is near, very near." She died October 25, 1900.